Exceptional post-Revolutionary map of the America Southest. 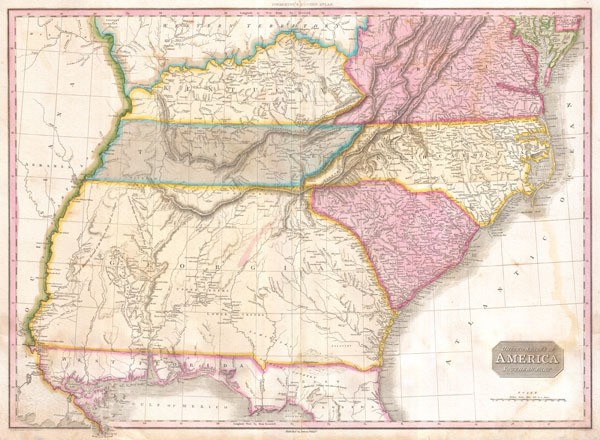 A rare and important 1818 map of the southeastern part of the United States. Depicts from the Mississippi River eastward to the Pacific, extends north as far as Delaware and south as far as Florida and the Mississippi Delta. This map was created during the transitional period of expansion shortly following the American Revolutionary War. Shows Virginia, Kentucky, Tennessee, North Carolina, South Carolina and Georgia. Predates the formation of Ohio, Illinois, Indiana and Alabama. Florida was not yet part of the United States but would join one year after this map was printed in 1819. Most of this map is given over to describing and notating the various American Indian nations active west of the Appellation Mountains. Notes the Creeks, the Seminoles, the Apalachi, the Choctaw, the Chickasaw, and others. Hunting grounds, villages and fortifications are noted, sometimes accompanied by the date in which they were destroyed. Also identifies the Wabash Company, the Jersey Company and the Illinois Company. These land companies were formed during the colonial period to acquire, sell, and colonize American Indian lands just east of the Mississippi. Drawn by L. Herbert and engraved by Samuel Neele under the direction of John Pinkerton. The map comes from the scarce American edition of Pinkerton's Modern Atlas, published by Thomas Dobson & Co. of Philadelphia in 1818. Very good condition. Very minor damp staining lower left corner, mostly confined to outer margins. Minor transference. Original centerfold. Blank on verso. Rumsey 0732.044. Phillips (Atlases) 724. National Maritime Museum, 409. Phillips (America), p. 880.